Like many other parents, my weekdays are filled with drop-offs, pick-ups and grocery runs. But unlike most other parents, I do these repetitive tasks by bike. What is family biking? Simply put, it is when some or all members of a family ride bicycles together, often as transportation. Children are often carried along on an adult's bike, sometimes on a cargo bike. Kids may also ride alongside on their own set of wheels. Many families choose family biking in order to live a lifestyle less dependent on cars, but most would agree they also do it because it’s fun. Since May is Bike to School Month, many families in the Puget Sound area will be arriving at school on two wheels. A great way to bike safely with older kids who can ride independently is to form a bike train: Parents ride with kids along a safe route while picking up new families along the way. Ask if there is someone organizing a train at your school, or help start one. As part of Bike to School Month, schools may also offer bike rodeos, courses using cones, ramps, and chalk markings for children to practice their cycling skills on the school grounds. Your school can participate by requesting a Bike to School Kit containing a banner, posters, stickers and healthy snacks. If you can’t bike all month, maybe you can ride to school on Bike to School Day on Wednesday, May 9, 2018. Make sure everyone in your family has gear that fits. This means both a bike and a helmet. For the smaller members of the family (babies and toddlers) there are trail-a-bikes, balance bikes (bikes with no pedals, also called scoot bikes) and, of course, bikes with training wheels. (Read more about balance bikes.) Many people don't realize the importance of a bell; make sure it’s ring-a-ding-dinging properly before you set out. Last but not least, remember that hydrating is crucial, especially in the summer months, so pack your water bottles. There are a number of ways to help your kids learn to ride safely. Practice basic skills first, making sure children are very comfortable and confident on their bikes with starting, stopping, steering and riding in a straight line (controlled riding). You can set up little obstacle courses to practice riding over sticks, around rocks and potholes and over bumps. You can also use a Little Tykes car to practice riding by a car when the door opens. Make it fun and work in manageable chunks of time. As our cities grow, my hope is that they also become more bike-friendly. By adding protected bike lanes separated from traffic and signals specific for bike lanes, sharing the streets with cars will become more comfortable. In the meantime, taking our kids riding on the street is a common fear for most parents. Truthfully, until kids are 11 or 12, their reasoning skills are not fully developed and they should not be making complicated traffic decisions on their own. "Children do not drive cars and are not aware of the most basic safety and street awareness that we take for granted-like riding on the right hand side of the road or looking for traffic coming from all directions," says Claudia Sjoberg, president of Pedalheads. Have a communication system set up ahead of time so you can tell kids when to stop or be aware. Teach your kids to always stop at intersections and get off and walk their bikes at stoplights or stop signs. Before you leave your neighborhood, practice the rules for riding on the street. In order to help recognize the street signs, take turns drawing them on the pavement in chalk. Practice hand signals, shoulder checks and bike handling in an alley or in an empty parking lot. Don't go too far at first. Little kids will get frustrated quickly if they can't keep up and older kids will be impatient if they always have to wait. Give your adventure a purpose by riding to a destination such as the playground, a friend's house, a coffee shop or school. When you get there your wee ones will feel proud of their accomplishment! On longer rides, use multiple routes until you find the one most comfortable for you. Ask advice from other riders about their routes, and traffic concerns. If your child is having trouble learning to ride a bicycle, or if you want extra skills practice, check out Pedalheads, a bike instructional program that teaches summer camps and classes. Whether your child is a first timer or needs the skills to navigate traffic safely, Pedalheads has trained instructors that will guide your child through the necessary steps. Ben Oryall, manager of regional expansion for Pedalheads, says, “The program is divided into classes suitable for children of all ability levels and provides an opportunity for children to interact with each other in a fun, educational setting.” Cascade Bicycle Club also runs summer biking camps for kids. I ride with two (and sometimes three) kids aboard, which I never thought was possible until I tried a cargo bike (any bike that hauls heavy loads.) They are designed with very low, granny, gears that make pedaling heavy weight much easier than you’d think. If you’d like to experience it for yourself, you can rent a cargo bike from Morgan Scherer of Familybike Seattle. She has a variety to choose from in her rental fleet (some are even electric!) Familybike Seattle also organizes Family Bike Expos and Get Started Family Biking classes, which include the opportunity to try out several different rigs. However you choose to ride with your child, please wave if you see us! We’ll be the ones ringing our bells frantically, while I struggle uphill with my children cheering me on. My hope is that more families are inspired to commute by bike and identify with a mom transporting her kids in a relaxed way, in regular clothes on a bicycle. Pedalheads offers biking summer camps and also has several open houses. 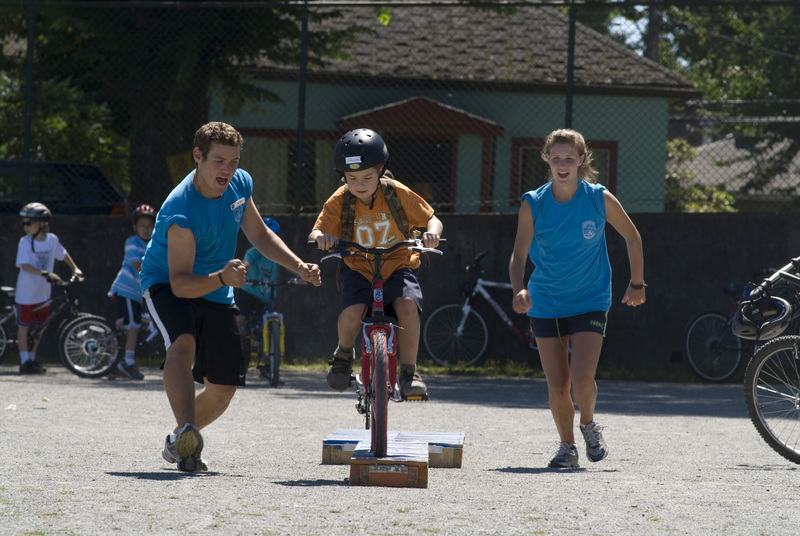 Cascade Bicycle Club offers biking classes and camps as well. Familybike Seattle: Rentals available: an electrified bucket bike, a double trailing bike, kids bike seats, a semi-recumbent tandem and more. Bike pick-up/drop-off is in the Rainier Beach or Wallingford neighborhoods of Seattle. Editor's note: This article was first published in 2014 and last updated in 2018.